Today marks the official anniversary of the end of Prohibition, the failed experiment that lasted far too long in the United States. We've made a lot of mistakes in our history and we continue to make them. But Prohibition was a disaster by almost every possible measure. 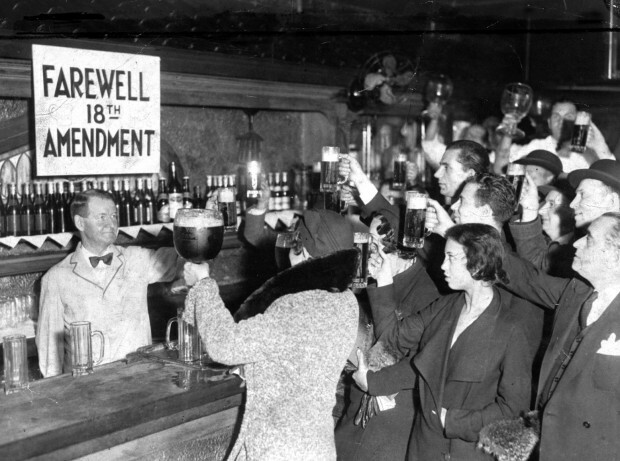 The end came on Dec. 5, 1933, when Utah (irony) became the thirty-sixth state to ratify the 21st Amendment, which repealed Prohibition. Recall that there were then 48 states and amending the Constitution required ratification by 36 of them. People tend to forget that Oregon, which was the seventeenth state to ratify on Aug. 7, 1933, had been wallowing in Prohibition longer than many states. Statewide prohibition was approved by voters in the 1914 election and went into effect on Jan.1, 2016. In fact, prohibition was largely a rural phenomenon. Portland and Multnomah County narrowly approved statewide prohibition in 1914. By the time Oregon voted on national Prohibition in November 2016, those same folks had seen enough and rejected it by nearly 10,000 votes. But rural Oregon went the other way and national Prohibition arrived on Jan. 16, 1920. The stench of the Prohibition era rubbed off fully in Oregon. Most breweries closed. Those that remained converted to sodas, syrups and near beer. But beer was never the problem. The problem was liquor. During Prohibition times, that included local moonshine as well as whiskey brought in from Canada via speedboats up the Columbia River. There was little interference with the movement of contraband. Portland became a hub for liquor distribution, supplying establishments that consumed vast amounts of alcohol, often with the knowledge of paid off local police. Some speakeasies were paying $100,000 a month for police protection. When they did conduct raids, police typically targeted small time operators who couldn't afford protection. Confiscated liquor often found its way into the hands of high ranking officers and city officials. As was the case in many cities, Portland never accepted Prohibition. Most Americans knew by the late 1920s that the grand experiment was not working. Corruption was everywhere, infesting public and private institutions. Gangland killings were a regular occurrence. To many, prohibition laws appeared to be unenforceable. Still, the end didn't come as soon as many hoped and expected. Anticipating repeal of the 18th Amendment, Portland's largest breweries, Henry Weinhard and Portland Brewing, merged in 1928. Arnold Blitz, owner of Portland Brewing, was named president of newly formed Blitz-Weinhard Brewing. The company had jumped the gun on the end of Prohibition by five years. In the end, it was the Great Depression that finally tipped the balance in favor of repeal. In tough times, Americans decided the country needed the economic stimulus provided by legalizing the manufacture and sale of alcohol more than they needed to continue on with a failed law. Franklin Roosevelt, running on a wet platform in 1932, won all but six states and beat Herbert Hoover 472-59 in the Electoral College. In Oregon, Roosevelt won by 75,000 votes out of 350,000 cast. Just as important, Oregonians voted to repeal state prohibition by 70,000 votes. Multnomah County accounted for 40,000 of those votes. 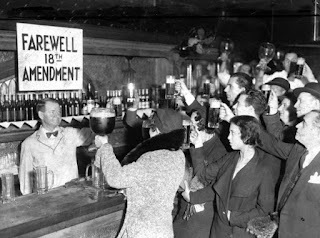 Although the end didn't officially come until Utah ratified the 21st Amendment, more immediate relief arrived in the from of the Cullen Bill, passed by Congress and signed by Roosevelt in late March 1933. The law legalized the production and sale of low alcohol (3.2% ABV) beer and wine and took effect on April 7, 1933...fondly referred to today as National Beer Day. In Portland, brewers were woefully unprepared to meet the expected demand on Beer Day. Congress and Roosevelt had given them just two weeks to ramp up production and it wasn't enough. As a result, thirsty Portlanders consumed every available drop of beer. Blitz-Weinhard, tapped out completely, was unable to fill orders for two weeks. Most of this story is lifted from Portland Beer. One thing I don't address in the book is why Prohibition failed. The main reason, I think, is that it's difficult to legislate and enforce morality. The other is Americans like to drink and most of them didn't stop drinking during Prohibition. They simply ignored the law, which led to a lot of arguably more serious problems.